but please don't do that with flesh & blood ANIMALS, as distinct from shoes or cars or whatever that is not sentient. This whole business and what Pedigree Database is built on is about buying, selling, reproducing, and owning animals. The inference that I would take it out on any of my pack that may have been party to a lesson learned is chilling. I would like the reader and researcher of the DDR to read the 2 previous posts/comments, compare them, and read them again. One is from someone who prognosticates with their "Do as I say and not as I do" , not really knowing how they would actually do if they had their own money on the line on a regular basis. The other is an actual buyer who faces the myriad of decisions and yes emotions of buying a living animal on a regular basis. I also was interested in buying pup from Stasi, but I am glad now, life got in the way of that, even if it had not, the price on them would have put a quick halt to it anyway. Sometimes the "protection" comes from something as simple as the luck of the draw and unrelated circumstances. You just live and learn, some lessons cost more than others. I appreciate learning this one has not cost me, and I feel bad how much he it has cost others. Spoken by a person who actually "gets it". Someone who actually does and faces life's many choices as a doer, who not only has shared their "newbie" lessons learned long ago on this thread but is happy to learn from other peoples lessons which is the purpose of this thread. Because unlike the other commenter they do not claim perfection or omniscience and readily admit they too have paid for some lessons which will happen if you get off the sidelines and into the "game"
A wise person once said "I certainly still have plenty to learn, ......You can never know to much"
kitkat3478 It would appear your years of experience and lessons learned has not made you arrogant, but humble, willing to share your hard lessons learned. Looking forward to seeing those pics! you don't notice your hostile tone toward anyone, who's not taking your issue close enough? look, people don't know neither you or your objectives. could be you're great person. could be some sneaky breeder, who's looking for revenge because of broken plans. who knows? past year on this board was pretty much similar case with pup from that kennel and seems not really honest US breeder. i never claimed any sort of loftiness or superiority. it just happened that from about 1970 to 2000 i didn't know any other kind of GSDs than DDR type and obviously do have plenty of experience with that type of dogs. you see, for you DDR dog is a dog with accurate paper proof of that. for me foremost its a dog with innate particular type of character/personality and temperament. your remark "everbody in the West wants those dogs", way too far from reality. mainly these "everybody" want exotic pedigree and have no worry that in past not pedigree did DDR dogs of what they was. in regard of me not sharing info, well, that again not true. on this board discussion about DDR dogs very rare but perhaps i'm only the member here who's strongly advocating/promoting them on every opportunity. you're first who ask for breeders of DDR bloodlines. most likely not full but anyway here is list of kennels and breeders just in Germany, who's dealing with them. You are correct.... you don't know me, or what kind kind of person I am...... but my customers know the real me. I really know nothing at all about you other than what I have learned from your writing. For example I can tell English is not your first language and you have been a student of the DDR for many years. But other than that I don't even know if you are even on the list you posted. I don't think you really "know" someone until you do business with them. I wanted and still want DDR shepherds for what they are and what they were made to be by the GDR. From a business standpoint I want the proper documentation to be able to speak honestly with my customers. So Why did I ask for the list? Because I don't know everything like some people. I want to, and I am willing to learn from someone like yourself that has been an expert of the DDR for many years, and has actually transacted and worked with them for many years. I have very little patience for someone who has never made any transactions in the topic of discussion, yet knows everything and never makes mistakes. "everbody in the West wants those dogs", way too far from reality. While "everybody" may not have been the best choice of words, German Shepherds are the #2 most popular dog in the USA and they originated and still come on a regular basis from Europe. The point I was trying to make is that many of the great GSD's such as the Czech's and DDR's came from countries in political turmoil that don't/didn't have the rule of law we have come to enjoy in the US. So why do I breed and sell GSD's? Perhaps my mission statement will help pull back the curtain a little bit. "Our goal is to raise Shepherds to enhance the lives of our owners"
i'm not in list and i never been involved in breeding of dogs. dog was only 1 year old but already started to be used as stud dog. 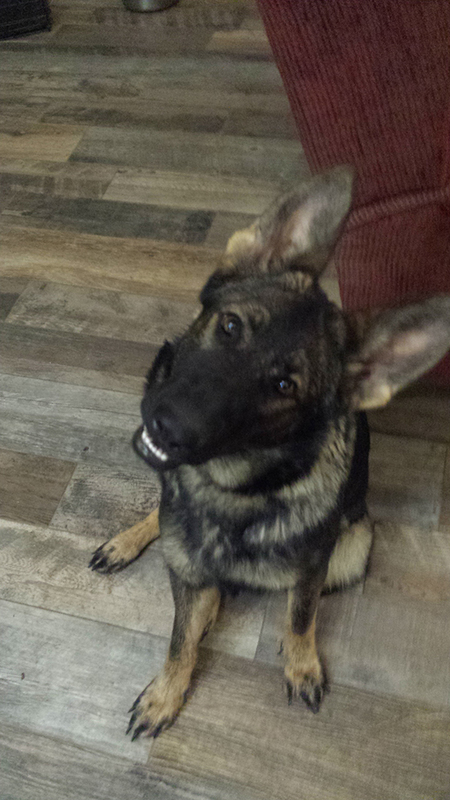 breeder does claims to be in business "for over 25 years" and "When I decided to breed German Shepherds I did so believing that we did not need more German Shepherds in the world but we did need better German Shepherds!" what a shame, after such proclamation to use dog, who not yet reached physical maturity and not yet show his potential, to produce even more dogs with unpredictable outcome. i guess motif behind such hurry - to get out of red ink and begin to gain dividend as soon as possible. commercial breeding have no time to wait for at least 2½ - 3 years to evaluate worthiness of dogs. but that "DDR" dogs and i'm pretty sure pups will be sold at premium price, regardless of their qualities. in former DDR this breeder would be kicked out with lifetime ban to participate in breeding GSDs. litter from such breeding couldn't never be registered. that's a difference between dogs been bred in former DDR and "DDR-ish" dogs "manufactured" in commercial environment. today it doesn't matter, in West or former Eastern bloc. dogs being bred mainly not for their betterment but for monetary gains. ValK - great point, succinctly made ! Re ValK's post--in addition to the points you already made, it appears that neither parent has had their hips or elbows certified by a recognized certification body. Both had their hips and elbows "...examined by Virginia Tech and received a passing grade..."
obviously you much better know reliability of hip/elbows assessment by different organizations. i never been familiar with this aspect. my point was that in former DDR pups cannot be registered if their both parents not yet received breed survey. to be eligible for koerung dogs must pass age 2 years. even after that, koerung itself wasn't the gate for breeding. dogs should gain sufficient value on the rating scale. pups from dogs, who went through evaluation but gained not sufficient values on wertmessziffer scale, won't be registered as well. that was mandatory rule for common hobbyist breeding. specialized breeding was even tougher in requirements to dogs. Isnt that why alot of people want the DDR dogs because they WERE (past tense) subject to stringent breeding requirements? A perception that still lingers even though those requirements are in large part no longer followed. i never been involved in breeding of dogs. Where, How, have you gained your vast knowledge of the DDR? Hugo Stasi (DOB 09.12.2017) Litter This litter is tapping into bloodlines from the old East Germany previously unavailable, through the sire Hugo Stasi. Here again we have an issue of a NOT verifiable 100% DDR Hugo Stasi through his dams side being marketed as a DDR "with previously unavailable lines....... although there may be some truth to that because of the Kabuschsee sire. 1) I thought you couldnt register UCI dogs with FCI. How did Alex get a UCI dog registered with the FCI ? 2) What benefits do you see with the Kabuschsee dogs and do they actually have some rare DDR bloodlines?